LONDON, UK, 21 APRIL: With a global climate change deal expected at the United Nation’s COP21 summit in Paris this year, the rapid development of practical solutions for cutting greenhouse gas emissions is gaining momentum. Selected North American graduates and students are set to join a world leading Climate-KIC program in Europe to focus on these new opportunities. “Seeing these young talents dedicate their time to solving today’s biggest challenges — instead of contributing to their causes — makes me confident that we are on the right track to make positive impact. 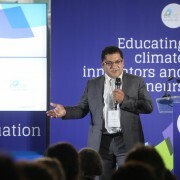 This new generation of entrepreneurs is the key ingredient in solving our global challenges,” says Ebrahim Mohamed, Director for Education, Climate-KIC, about Climate-KIC’s European “The Journey” summer school programme. Summer school ‘The Journey’ has been run for over five years in Europe with over 1000 participants. EU initiative Climate-KIC has now for the first time also launched a special global edition to bring together top graduates from around the world. The five week course is set to offer a unique combination of science and entrepreneurship. It will be a crash course to identify opportunities in climate change and how to set up a startup to commercialize solutions. “Climate-KIC’s international summer school is a huge opportunity for American and Canadian graduates and students to become the next leaders in the low carbon economy, to take direct action on climate change, and to become part of a global community of young leaders. 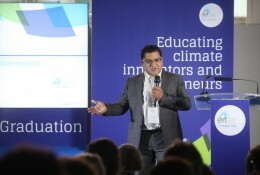 With worldwide economic losses due to climate change already estimated at $1.2 trillion per year, we urgently need specialized innovators and entrepreneurs to help develop and implement new solutions to climate change,” says Ebrahim Mohamed, Climate-KIC’s Director for Education. The best 45 international applicants to the course will journey across Great Britain, Germany and Switzerland, gaining insight and experience from a selection of Europe’s best universities and most innovative businesses. They will be joining a larger program of 300 European students who are taking part across Europe, with the aim of becoming the climate change leaders of tomorrow. Universities part of ‘The Journey – Global Edition’ include Climate-KIC partners Imperial College London, University of Reading, ETH Zurich and Technische Universität München. Climate-KIC is supported by the European Institute of Innovation and Technology (EIT), a body of the European Union. In a short period of time the summer school participants develop ideas that really have the potential to make a difference. “Seeing these young talents dedicate their time to solving today’s biggest challenges — instead of contributing to their causes — makes me confident that we are on the right track to make positive impact. This new generation of entrepreneurs is the key ingredient in solving our global challenges,” Mohamed adds. Students work on ideas for solutions to real-world climate related issues and compete in teams. Based on their own creativity and climate change knowledge, the teams present a detailed business plan to a judging panel consisting of leading venture capitalists, start-up entrepreneurs and scientists. Climate-KIC’s multidisciplinary approach to climate change mitigation and adaptation is reflected in the academic background of the summer school participants. In 2014, just 34% of the participants had science and environment related qualifications with the majority specializing in business, humanities, architecture and other engineering courses from aerospace to construction. The deadline for North American graduates and students to apply is 15 May 2015, scholarships are available for uniquely qualified applicants. 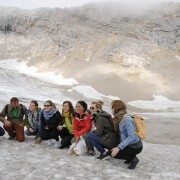 Students and graduates visit the German Meteorological Service (DWD) on Germany’s highest mountain “Zugspitze” near Munich, Germany. During the 2015 edition of Climate-KIC’s European “The Journey” summer school programme international participants will offer a unique combination of science and entrepreneurship. It will be a crash course to identify opportunities in climate change and how to set up a startup to commercialize solutions. Students and graduates discuss a business plan that helps tackle climate change at Imperial College London, UK. 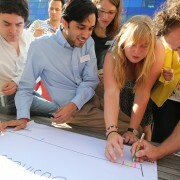 Participants in the 2015 edition of Climate-KIC’s European “The Journey” summer school programme work on ideas for solutions to real-world climate change related issues, and compete in teams. Based on their own creativity and climate knowledge, the teams present a detailed business plan to a judging panel consisting of leading European venture capitalists, startup entrepreneurs and scientists. The organization has its headquarters in London, UK, and leverages national and regional centers across Europe to educate students and professionals, to support start-up companies and to bring together partners on innovation projects to bring about a connected, creative transformation of knowledge and ideas into products and services that help mitigate and adapt to climate change.